Complete your SoilWarrior system and perfect your tillage zones with durable ETS accessories. Tough soil conditions? 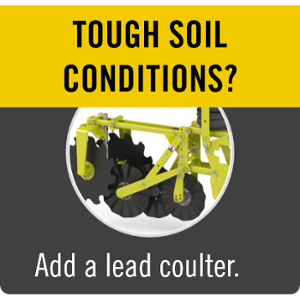 Prepare a better seedbed by adding a lead coulter to each SoilWarrior XS row unit. Eliminate potential variability in the zone as the lead coulter slices through roots and tills the center of the zone. Made of grade 50 steel, this accessory includes an oil-filled hub, tapered roller bearings for durability and common components for easy maintenance. This lead coulter kit is a bolt-on replacement for the gauge wheel on SoilWarrior XS row units. Order yours today! Image represents field-tested prototype. Production model design may vary. Finish a better seedbed when strip-tilling in the spring and seal them in the fall with ETS Rolling Baskets. Constructed from robust steel, with hardened steel bushings, and high quality bearings. Baskets are 13.5" wide, 12.5” in diameter, and are adjustable from a flat surface or building a 1.5” to 2.5" tall berm. They are available for 20”, 22", and 30" row spacings and are easy to attach to SoilWarrior X and N row units. Different designs available for twin row and sandy soils. Clear trash and residue ahead of your tilled strips with ETS zone cleaners. Solid construction and innovative design keeps them rolling through heavy crop residue at high rates of speed. Easily attached to SoilWarrior X and N row units. Add a shank and knife to the SoilWarrior N row unit to increase tillage depth to 9 inches and apply NH3. Let there be light! Make in-field adjustments and identify potential problems at night with our new working light kit. The kit consists of three high intensity LED spot lights (1568 lumens per bulb), a mounting bracket, and wire harness. Lights are fully adjustable for optimal positioning. Easy to install on any SoilWarrior model. Bracket mounts to SoilWarrior dry fertilizer tanks or satellite mounts. Connect wires directly to existing lighting harness on new SoilWarrior systems (2016+) or retrofit to older units by connecting with the lighting harness. We have several types of tillage coulters to match your soil type.